If you read my blog, you may know I have been lusting after floral boots for, well for years (that’s embarrassing). Just buy them, for crying out loud, it’s not like buying a Mustang convertible. So I finally succumbed and bought these so-cute booties via Nordstrom (free shipping and on crazy sale). I adore them, they go with everything, and the low heel makes them walk-able too. These are similar. 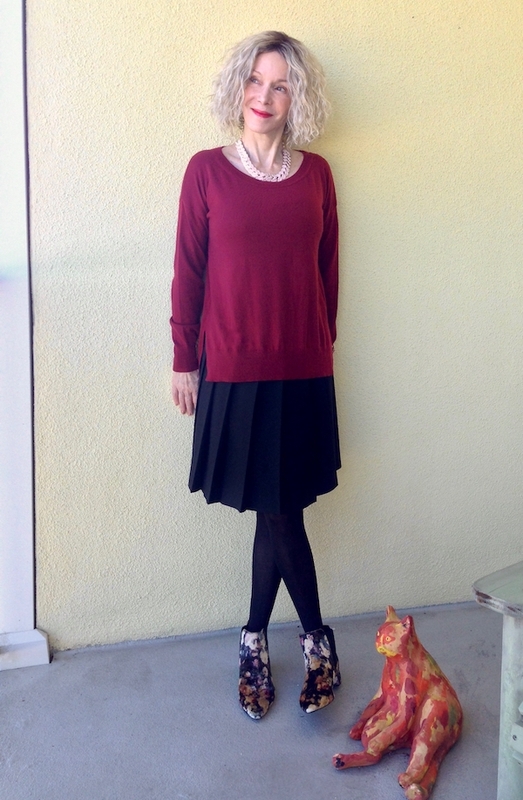 I’m wearing a recent thrift prize – a simple black pleated Theory skirt (similar). It’s the perfect length and has just the right amount of swing. My top is actually one I purchased NEW and RETAIL, yes I have to sit down for a moment. It’s a very soft medium-weight sweater by GAP (similar) and it filled a wardrobe hole. As for the floral boots, well I think you’ve heard enough about that love story. The gorgeous vintage necklace (sim) was a gift from a friend. Black tights with everything, as long as the temperatures stay below 75 degrees. 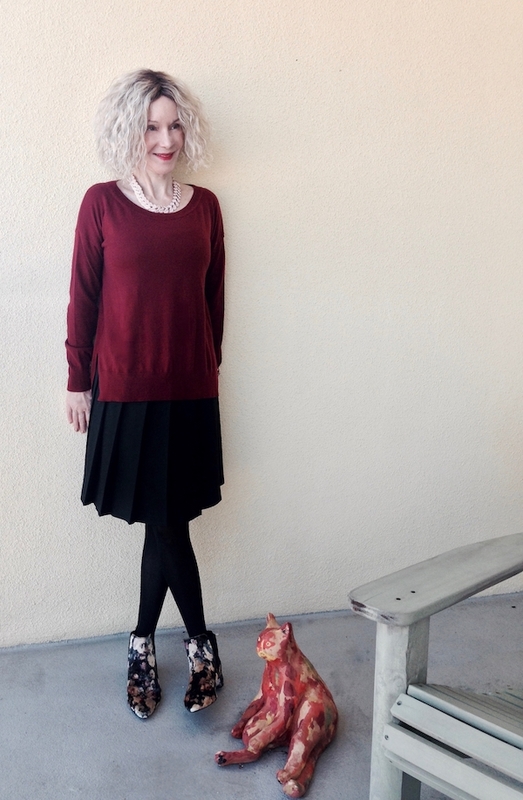 I like a super-simple look many days, with just one or two fun accents. Kitty, on the other hand, is a glamour-puss. Yay!! You made your dream come true, that’s what it’s all about!! They are such a fun way to add pattern to any outfit, just so lovely! Fabulous boots! Well done to have waited to get such a great deal. I would love to have a similar pair too. And the outfit shows off each piece so well. Thanks for the linkup, Patti. Nawet nie udajesz, na prawdÄ™ jesteÅ› gÅ‚upi. Poza tym, po treÅ›ci ,ktÃ³rÄ… zacÅmi›eiÅ‚eÅ›,wnoszÄ™,Å¼eÅ› katol. Tak wrÄ™cz sÅ‚odycz katolska bije z twoich wypocin,Å¼e rzygaÄ‡ siÄ™ chce. CaÅ‚e szczÄ™Å›cie,Å¼e p. Jerzy jest inteligentnym czÅ‚owiekiem, a takie Ä‡woki mogÄ… mu nagwizdaÄ‡ . A ja mogÄ™ ci nabluzgaÄ‡, bom nie katol.Ale nie chcÄ™,bo szkoda sÅ‚Ã³w. Thanks for the link up party Patti. And how lucky that we’re both cooing over our fab floral boots this week! You’re so right to underplay the rest of the outfit and let your boots do the talking. Me, on the other hand, it’s all sparkle, shine and tapestry – not shy and retiring in the least. I saw those boots on your Instagram – superb! Pretty floral boots , definately a good buy , perfect today with the burgundy and black. Enjoy them! I’m always so afraid to buy shoes like that. I should just go ahead and do it, right? I guess I’m just always like “what would I wear with them?” Thanks for the inspiration! Oh those boots! I too have lusted over those booties. Be careful if you bring them along to Arizona ; ) They might not make it back in your suitcase. I like the chic casual vibe and the punch of the booties. I see the reviewers for your boots said to size up one whole size!! And Nordstrom’s says the same… Did you find that to be true? ADORABLE! I love your floral booties and now have my eyes out for floral shoes for spring! Happy Monday! Those floral booties are awesome Patti and I just love that stunning cranberry sweater! Looking great Patti! I’m on the hunt for some lovely ankle boots too. I know I’m fussy, but it is difficult to find just the right pair! Oh, such gorgeous boots! A beautiful way to add some extra glamour to whatever you may be wearing. I have to admit floral boots are high on my wish list at the moment. I’m obsessed with those floral boots! So fun and chic! Oh these boots, Patti! AMAZING! I have a pair of floral Doc Martens but have also been wanting a pair of floral dressier boots. I need to just buy them as well! I absolutely love this outfit. Something I would totally wear myself. Great look! So glad to join you another week, my dear patti. Those boots are amazing and I’ve been lusting after floral, velvet boots too! They look great with your outfit. Congrats on your new boots! They look great! Could you include a close-up pic, please? I noticed how cute your hair is looking. I love your floral boots! You’ll enjoy them so much! Love the booties. So unique! I, too have some floral booties—and I absolutely love them!! It’s good to “reward” ourselves at times, I think!! Yay! I applaud your decision to spoil yourself. With small purchases like this, no justification is required. The booties are very cute. Oh that’s all so pretty, Patti. Score! Love your boots and that outfit is perfect to show them off!! Thanks for hosting, Patti! What a lovely look and those boots are glorious. As they say, wear them in good health. Thank you for the link up and I hope that the week ahead is fabulous. Fun, funky and all things fabulous!! I’d be lusting after those too!! You look so stinkin’ cute!! Cute outfit, Patti! Thanks for the link up and have a great week! You and me both! Modern Vice has some flowered Handlers that I so want and I love the skirt, nothing better than a thrifted gem! Yes, the boots are fun. But to be honest, I didn’t even notice them at first… OK, I’m not into shoes. It was your lovely red top that caught my eye. The colour is just amazing. Just the perfect shade of dark(er) red, not too overwhelming but bright enough.